We could not let go of our last food trip at Sambokojin barely just a few days ago. So after our quick trip in the city, we finished the day with some good Japanese food at Little Tokyo in Makati. 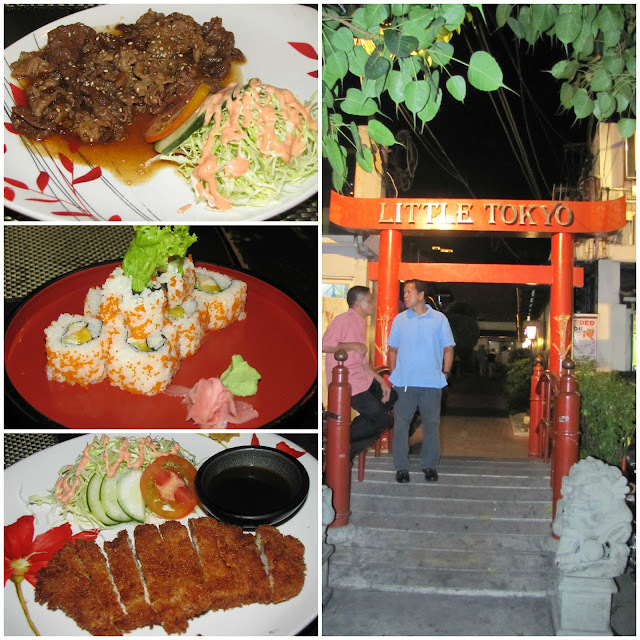 Little Tokyo is a compound in Pasong Tamo, Makati which houses restaurants that serve the best Japanese cuisine. Most of these are owned by Japanese entrepreneurs. This may come to no surprise how locals and even foreigners alike head out this side of town to enjoy food and at least feel like they are right at home. On a weeknight, most of the restaurants are packed with people. Some even had to wait to be seated, that speaks for something I guess. The place can cater to what I think is about 100 people in total. Housing 13 small Japanese offering to fix your Japa-nom craving. We dined at Riozen as it was the only one with little or no people dining there. We opted to stay outside for some al fresco dining experience. Checking the menu, they had a hefty items on the list and we choose the tried and tested safe bets. We ordered Beef Yakiniku which was good on its own. It had a side dish of freshly made coleslaw with a slice of cucumber with tomato and a bit of what seemed like the usual dressing. An odd pairing but I quite enjoyed this dish. The sauce was soy based and the sesame added texture to the tender beef slices. It was rather good specially when paired with rice. Other than the yakiniku, a favorite staple is California Maki. I have had good ones and some blah ones but this was just right. It's a bit odd seeing the lettuce there in the presentation but it wasn't too bad. We ordered two plates of these baby. And lastly, we had tonkatsu. I was expecting to see it golden as it should and this one looked rather brown. They had the same side dish with the yakiniku which came along with their version of a sesame dip. It was overcooked for my liking but it was enough to get me by the night. I would have to say that I have had better Japanese food in Cebu like Joed's and I would not want to generalize Little Tokyo as well so I guess I needed to visit the place again soon and try something else.